Are science and religion at odds with each other? A majority of the public says science and religion often conflict, with nearly six-in-ten adults (59%) expressing this view in newly released findings from a Pew Research Center survey. 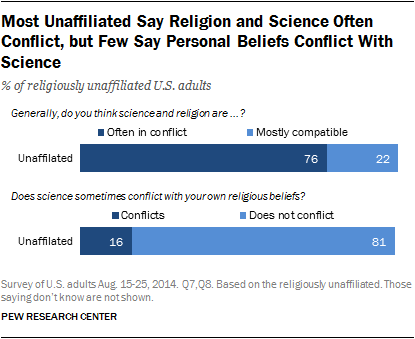 The share of the public saying science and religion are often in conflict is up modestly from 55% in 2009, when Pew Research conducted a similar survey on religion and science. People’s sense that there generally is a conflict between religion and science seems to have less to do with their own religious beliefs than it does with their perceptions of other people’s beliefs. 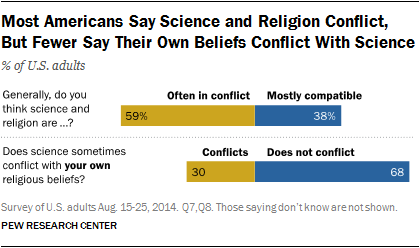 Less than one-third of Americans polled in the new survey (30%) say their personal religious beliefs conflict with science, while fully two-thirds (68%) say there is no conflict between their own beliefs and science. Moreover, the view that science and religion are often in conflict is particularly common among Americans who are, themselves, not very religiously observant (as measured by frequency of attendance at worship services). 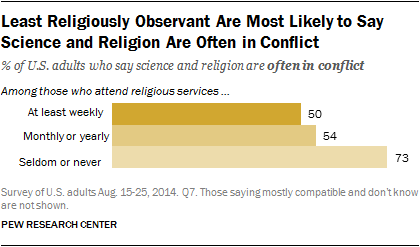 Some 73% of adults who seldom or never attend religious services say science and religion are often in conflict. By contrast, among more religiously observant Americans – those who report that they attend religious services on a weekly basis – exactly half (50%) share the view that science and religion frequently conflict. Of the country’s major religious groups, Hispanic Catholics and white evangelical Protestants are especially likely to say science and religion are mostly compatible; roughly half of both groups take this position. But white evangelical Protestants also are somewhat more likely than members of other large religious groups to see a conflict between science and their own religious beliefs; 40% of white evangelicals say their personal beliefs sometimes conflict with science, while 57% say they do not. The share of all adults who perceive a conflict between science and their own religious beliefs has declined somewhat in recent years, from 36% in 2009 to 30% in 2014. Among those who are affiliated with a religion, the share of people who say there is a conflict between science and their personal religious beliefs dropped from 41% to 34% during this period. The general public is closely divided in its views about the role of religious organizations in scientific policy debates. Overall, half of adults say churches should express their views on policy decisions about scientific issues, while 46% say churches should keep out of such matters. White evangelical Protestants and black Protestants are more inclined than people in other major religious groups to say churches should express their views on such topics. A majority of those with no religious affiliation say churches should keep out of science policy debates. These are some of the key findings from a Pew Research Center survey conducted Aug. 15-25, 2014, by landline and cellular telephone, among a nationally representative sample of 2,002 U.S. adults. The margin of error for results based on the full sample is +/- 3.1 percentage points. 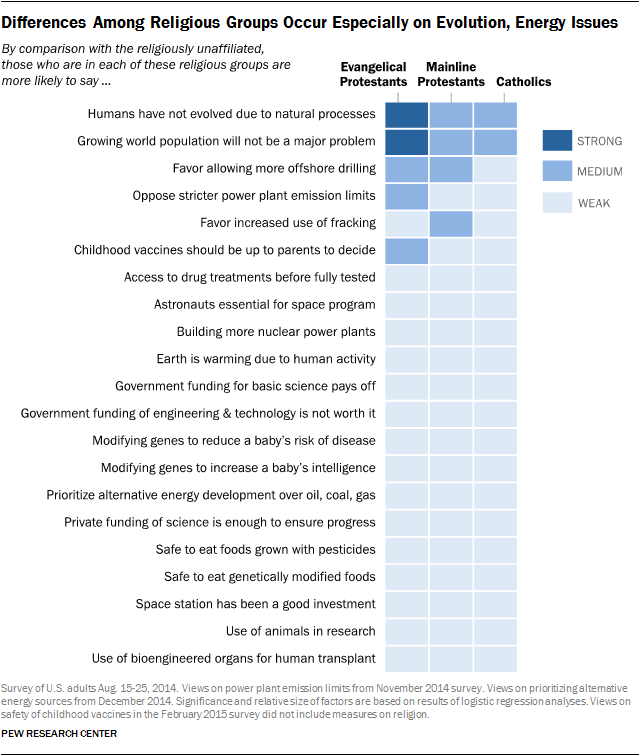 Despite the differing views about the relationship between science and religion, there are only a handful of areas where people’s religious beliefs and practices have a strong connection to their views about a range of science-related issues. Statistical modeling shows religious differences in affiliation and worship service attendance come to the fore when the issue is related to human evolution or the creation of the universe. 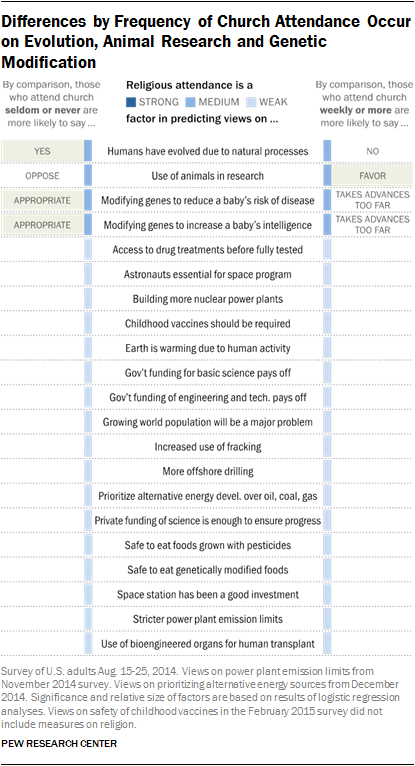 As Pew Research Center noted in a related report, there are multiple influences on people’s attitudes and beliefs about science topics. Public attitudes and beliefs about science topics are sometimes connected with political and ideological divides, while other differences in people’s views are connected with generational divides, educational attainment and knowledge about science, gender, race and ethnicity and, at times, religious factors. Based on statistical modeling techniques that parse the independent effect of multiple factors at the same time, religious factors appear to be central to public views on only a handful of science topics. Foremost among these are people’s beliefs about human evolution. While other factors – especially political attitudes and educational attainment –also play an important role in adults’ beliefs about human evolution, religion is among the strongest predictors of their views on evolution, even when accounting for other influences. Similarly, religious group differences are particularly strong determinants of whether people perceive the existence of a scientific consensus about evolution and the creation of the universe. In addition, there are a handful of biomedical topics where differences in religious observance, as measured by frequency of worship service attendance, play a sizeable role in shaping public views. One example is the use of genetic modifications to reduce a baby’s risk of serious diseases. A majority (61%) of U.S. adults who regularly attend worship services, regardless of their particular religious tradition, say genetic modification for this purpose would be “taking medical advances too far.” By comparison, among adults who seldom or never attend worship services, 55% say genetic modification for this purpose would be an appropriate use of medical advances and 41% say genetic modification for this purpose would be taking advances too far. On a handful of energy issues, religious affiliation is just one of several factors that help to predict people’s views. For example, public attitudes about offshore oil drilling are strongly related to political party affiliation and ideology. But there also are differences in views by age, gender and religious affiliation, even when differences in political orientation are held constant. For example, both evangelical and mainline Protestants are more likely than religiously unaffiliated Americans to support more offshore drilling, with other factors held constant. Further, U.S. adults with a religious affiliation, such as Protestants, Catholics, Jews and Muslims, are more inclined than those with no particular religious affiliation to believe that mankind will be able to stretch natural resources such that the growing world population will not pose a major problem. The remainder of this report looks at the degree to which public views about science-related topics are associated with religious affiliation and worship service attendance. As is typical of Pew Research Center reports, we characterize the relationships shown in these cross tabulations (sometimes referred to as bivariate relationships because they involve just two variables) based on tests of statistical significance that take into account the complex sample design of the survey.